Over the last 4 decades, UMass went from disposing of its trash at the Town of Amherst landfill, to the somewhat more distant City of Northampton Landfill - until 2004 when both landfills closed. At that point and until 2013, UMass trash was shipped primarily to the Waste-to-Energy plant in Agawam called Covanta. Today, UMass trash makes its way through the Complete Transfer Station in Holyoke to the Southbridge Landfill in central Mass. and to landfills in upstate New York. The cost trash disposal – including shipping and equipment rental – ranges today from $80 to $120 per ton: the lower amount for large WRTF transfer station loads and the higher amount for shipment via t the smaller compactors. The disposal portion of that per ton cost – called the trash tipping fee – has risen and fallen in cycles over the last 30 years based both on expanded regulation of disposal facilities and the change in disposal capacity supply and demand. Today’s trash tipping fee of $67 per ton is about average for that 30 year time frame. In 1990, facing dwindling landfill capacity and rapidly escalating disposal costs in Massachusetts, the Commonwealth instituted the first waste ban – one among a series it would roll out over the next 25 years. The objectives included both environmental protection - cathode ray tubes, fluorescent bulbs, PCb containing appliances kept out of landfills and incinerators, and, resource conversation – recapturing the resource and energy value of a wide range of recyclable materials. Most recently, the ban on commercial organic material from disposal facilities (2015) was intended both to extend the life of Mass. landfills and to make a significant dent in greenhouse gas emissions coming from the state’s landfills. What these bans mean for UMass is that a wide range of either harmful to dispose of , or, just plain recyclable/compostable materials - must be collected on campus and diverted to the proper processing and recycling plant. 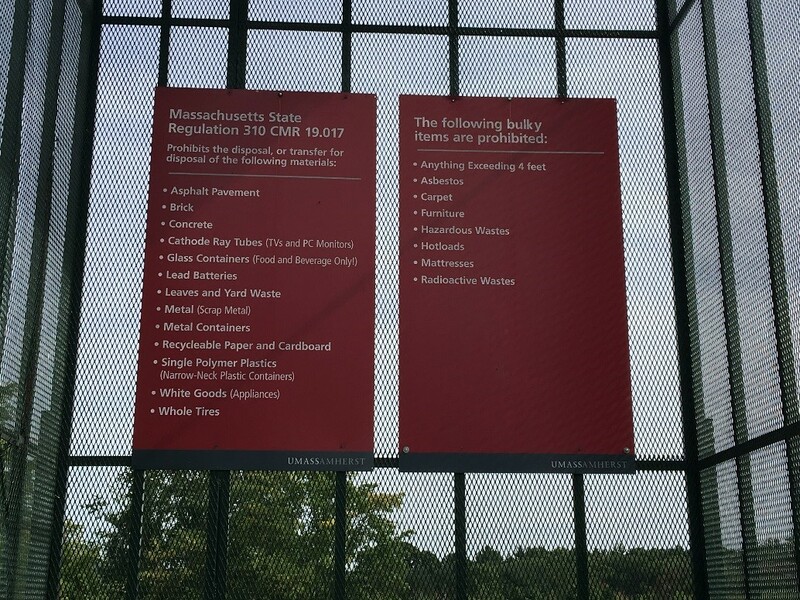 UMass hauls trash to the Holyoke Transfer Station which primarily ships it to the Southbridge landfill for disposal. Approximately 15-25% of the unwanted materials disposed of campus trash could be recycled as single stream recycling. Landfilling unwanted and then mining virgin materials to make new products is 17 times less energy efficient than recycle those materials into new products.